Along the shores of Lac Monroe in Parc National du Mont Tremblant in Quebec, Canada, some people have left their canoe to enjoy the picturesque sunset. After a day of activity on Lac Monroe in Parc National du Mont Tremblant in Quebec, Canada, a canoe is set to rest on the shore amongst the small rocks. With the bright yellow canoe highlighting the foreground of this picture, the sunset hues adorn the sky over the hills while a thin layer of fog hangs over the surface of Lac Monroe. For those people who enjoy exploring by canoe, a rental centre is located along the shores of Lac Monroe which is open from the middle of May until the middle of October. There are various outdoor activities available at Lac Monroe in Parc National du Mont Tremblant, some being canoeing, hiking, camping, swimming and fishing. Autumn is a quieter time of year to explore Lac Monroe, but the temperatures are much cooler and visitors should come prepared. 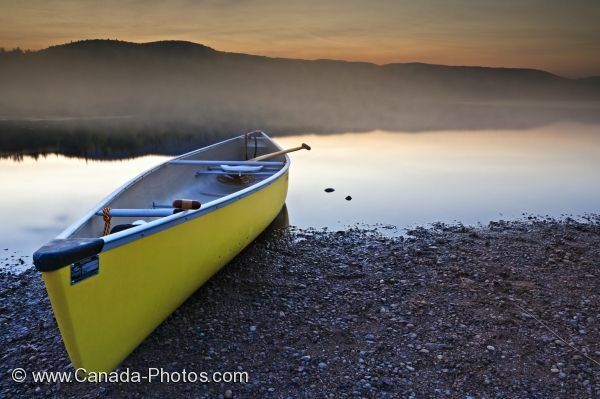 Picture of a canoe on the shores of Lac Monroe in Parc National du Mont Tremblant in Quebec, Canada at sunset. These fog banks are a common sight over Lac Monroe during the Autumn as the cooler weather begins to fill the evenings after the warmer temperatures throughout the day. A peaceful sunset will soon leave Lac Monroe blanketed in darkness and await the onset of another beautiful Autumn day in Parc National du Mont Tremblant in Quebec, Canada.